The Thunder women’s soccer team traveled to Montreal to play in the Canadian Collegiate Athletic Association national championship at the Montreal Soccer Stadium from Nov. 9 to Nov. 12. Out of eight teams from five different provinces, Algonquin finished fifth in the nation. After their loss to the Northern Alberta Institute of Technology Ooks on Nov. 11, Algonquin was forced into a placement match for fifth or sixth place against the Grand Prairie Regional College Wolves the following day. The girls were looking for a win in their final game, after their 3-0 loss to the Ooks that ended their chance of getting a national medal for the first time ever. The women entered the championship undefeated throughout the entire regular season and the OCAA championships with a record of 15-0-0, and coming into their final game of the year against GPRC, they boasted 1-2 national record. Their lone win being against the Wolves in the opening day of the tournament. Since the start of the 2011 season, Algonquin holds a combined record of 66-4-4. Not including nationals. Their wish came true with a 1-0 win versus the Wolves on the final day of the CCAA championships with Algonquin’s lone goal of the tournament, and Haley Martin’s first goal of the entire season, on a well-placed corner kick that ricocheted off a GPRC defender. Dom Oliveri, the head coach of the women’s soccer team at Algonquin, knew it was important for them to cap off the season with a win. Their goal scoring ability in the championship hindered them greatly, and a reason for this may be that their top-goal scorer, Vanessa Macmillan (26), was forced to play a maximum of 45 minutes per game while recovering from a concussion suffered against the Humber Hawks in the OCAA finals. In the tournament, she started the second-half only. That is, until their second game against the Wolves. Oliveri said he gave her the choice of which half she would like to start in. Macmillan, along with a few of their top players, will not be returning the next season. Second-year midfielder Becky Leese explained just how lucky they are to be able to end their season the way they did. Melissa Harrison, who is a fifth-year veteran, wasn’t allowed to play in her final game with the Thunder after receiving a red card on a questionable take down of a NAIT defender in the second half of their game on Nov. 11. She was forced to sit in the stands and watch the game as a spectator. A day prior, the Thunder played the Ooks in a game that would send one of them to battle for a CCAA bronze medal, but on paper, the Thunder couldn’t muster up enough offence to keep themselves in the game. Algonquin had two goals called off due to offsides, which Oliveri felt were not good calls. He believes that the way the game was called wasn’t fair to the players. “How do you walk into a room of 25 players and say ‘Oh, your season came down to a game where you were trying to win a medal, and the biggest person who had an impact on the field was a referee,’” Oliveri said. 1-0, who won the gold medal for the third time in a row in the championship. kicks and a win against GPRC. leave behind a legacy for the upcoming players. 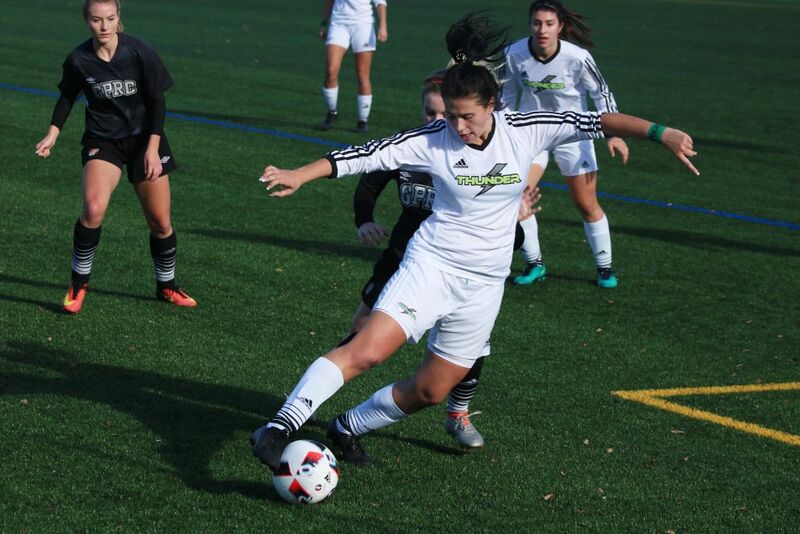 Algonquin women’s soccer team finishes fifth in CCAA Reviewed by Chad Ouellette on November 16, 2016 .